MDT ESS chassis, with the 15" no rail forend, OD green ceracoted. Atlas prs bipod, with riflestick grapler feets. Kahles K624i gen III scope with msr ki reticle. Remington 260 Barreled Action by LRI. Whiskey-3 Chassis Gen.5 custom painted by Patriot Valley Arms. Savage 111, McGowen 24" full bull barrel, 7mm rem mag, tacticool stock (MDT Gen 2 on order) Timney trigger 2.5 lbs, Vortex Viper PST gen 1. I maintain .6 MOA with it so far. the barrel is too heavy for the stock that it is no longer floated in the prone position. Mile high shooting just threaded the barrel to prepare the way for the Omega. 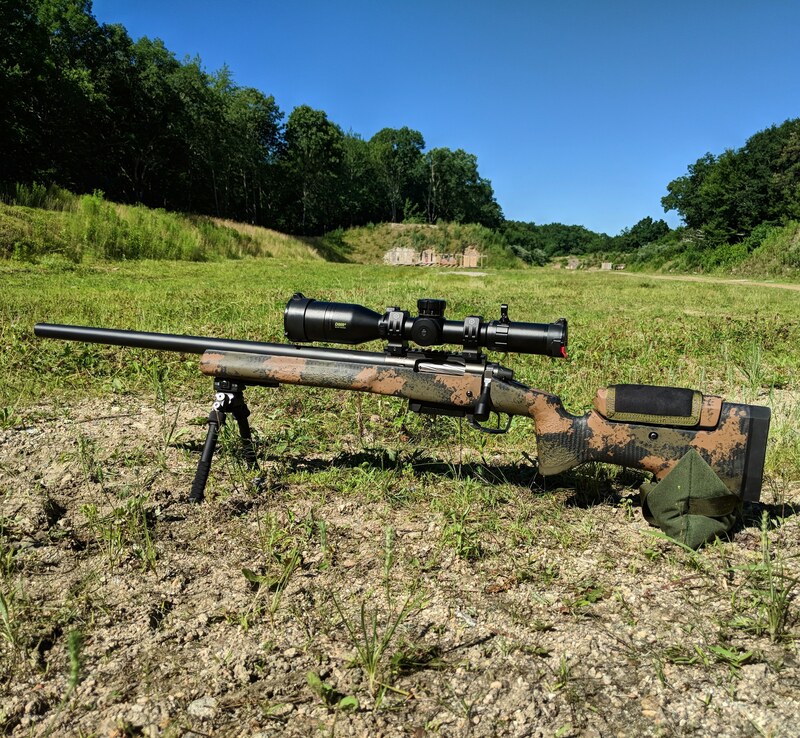 Shilen 26in bull throated .170"
Remington 700 Sendero, B&C Sendero stock, some cheap pad/saddle thingy, Harris 6-9, Leupold mk4 20moa base, Vortex rings, Vortex pst1 6-24x50 ffp mrad, 26" StraightJacket barrel, Teludyne magnum brake, magpul bottom metal, factory trigger tuned to 2lb. My buddy and I went out shooting this weekend. He was testing out his new to him rifle, and I was putting my new one through test. When I first started pining for a precision rifle, I looked at getting a Howa barreled action and putting it into an MDT chassis. I ended up getting an HCR in heavy Varmint, which I liked, but not as much as the TL3 I bought once I decided to just go down the rabbit hole. Criterion announced their Howa pre-fits, and I jumped right on that (because 1/3 of the fun for me is tinkering). For months, the HCR sat in the safe and pouted while the TL3 went out and had all the fun. A buddy had bought a Howa Hogue sporter and did a bunch of stuff to make it more precise, but it was nowhere near the HCR (which is about a .6 MOA gun). I finally asked him if he’d like to buy the HCR since I felt bad about not shooting it. He said he’d like to trade his Howa and give me some money. I thought, “Oooooh, a chance to build that dream Howa!”. We settled on a price, then went to our LGS to transfer. I took the money he gave me and bought an MDT ESS. After the appropriate amount of time was sacrificed to the Waiting On Gun Parts and Waiting On Waiting Period gods, it all came together. Getting the original barrel off wasn’t easy, but once I put some rosin in the barrel vice, the ring end of a 31mm wrench on the bar of the action wrench, and some M-A-N into it, it popped right off. No cutting or torches were used. Putting the barrel on was about the same as the Shilen & Proof barrels I’ve put on my TL3 (because I didn’t pull the ejector—that would make it a lot more complex, and part of this was to compare to the TL3). I wanted to shoot it without sending it to a smith be trued because I was interested in seeing if it would shoot well without that. I’ll let you judge. I must say I do like the ESS. I wish I could get the dovetail closer to the mag well, but the thing is easily adjustable. There are screws for locking it in place after adjustment and it’s super solid once that’s done. The PST glass is clear, and out to 300 yards, there was a small but noticeable difference from my AMG. Of course. I ran the turret all the way up then back, and it returned to where I expected. I haven’t measured the accuracy of the turrets. I expect I’ll have to use a scale factor with a scope at that price. The Criterion nut uses a 12-point 31mm wrench, so no special tool like the NSS nut I have for my TL3. It’s not easy to find a 31mm 12-point crow’s foot, though. The bolt knob needed both rubber rings that came with it to not spin when operating. I’ve included pics of the rifle and the sight-in group. Those are 1-inch squares and half-inch dots in the target photo. The sight-in was .23 MOA, and the next group was .4. After that, it opened up to consistently .6. I’m going to re-torque and loc-tite the scope rails to see if it tightens back up. Another buddy had some troubles with pic rails on his Howa. Is it the same as my TL3/XLR/Proof setup? Of course not. Is it better than my HCR? It shows potential to be. It’s certainly reasonable, and more fun for me (and more waiting) than just buying the HCR was. Have shot a few groups under .5 moa with Federal GMM. Plenty good for me! Just completed these two, leveled and bore-sighted. Will be taking them out this weekend! All I got at the moment. I got the stock as you see it from the guys at CSTactical. Great service from Mike and Richard! How do you like the chassis? Pros? Con's? Vs others. It’s the first chassis I’ve ever owned so I’m probably not the best to ask on this but I really am enjoying the MDT chassis. It shoots superbly and it feels rock solid. As someone without a ton of experience, I did enjoy the v-block that MDT uses. Just torque it to spec and go. I really didn’t like the looks of a lot of the other chassis options, but when I saw the gen2 version of the LSS I was immediately sold on it. @Tony1320 I just put one together and will post pics with a range report sometime this weekend. Is there a particular area you’re interested in seeing? Not exactly I just want to see a good picture of how the finish looks. Maybe a full side view? @1clicktrick I have the MDT LSS XL Gen 2 (Deviant LA/Bartlein 300 Norma), MDT ESS (Howa 1500/Criterion 6.5), XLR Envy (TL3/Proof 6.5), and had the Accurate Mag chassis that came with my HCR in 6.5. The finish of the XLR stuff is quite a bit smoother than the others and the parts just fit together better than the MDTs (smaller gaps). Both MDT chassis and the Accurate Mag needed longer grip screws than the came with because I like the Ergo Deluxe grips—the XLR came with a longer screw. I like the XLR folders, and put them on the LSS Gen 2 and Accurate Mag chassis, but it took some fiddling and blue loc-tite. I’ve mentioned before that the rifles on the MDT chassis needed tightening after sight-in, but that was the rail/action interface, so nothing to do with the chassis. I really like the adjustability of the ESS, but I wish the forend wasn’t a tube (even tough a night vision bridge is tactical as f*ck ). You do have to use a tool to lock down the ESS once it’s adjusted, but you can move things around with the adjustment wheels while you’re figuring that out. On the XLR stuff, it’s all screws and adjustment is more involved and slightly more frustrating. So, if you’re going to let someone else use the rifle and want to get it to fit them well, MDT’s adjustable stocks are a better choice, IMO. I like the look of the MDT chassis slightly more, but feel that the XLR Envy is slightly better. The 300 Norma is getting an XLR Envy now that they’re making them for the Deviant LA. Well. I'm pretty new here so, thanks for having me. I submit for your criticism, my horizontally challenged "precision rifle" build. @dfuller81 That’s a beautiful rifle! What was involved in getting the RRS dovetail on it? I bought the stock with it already. But, Area 419 makes the "improved Arca Rail" $100. I have it on this rig and my gas gun. Well. I'm pretty new here so, thanks for having me. 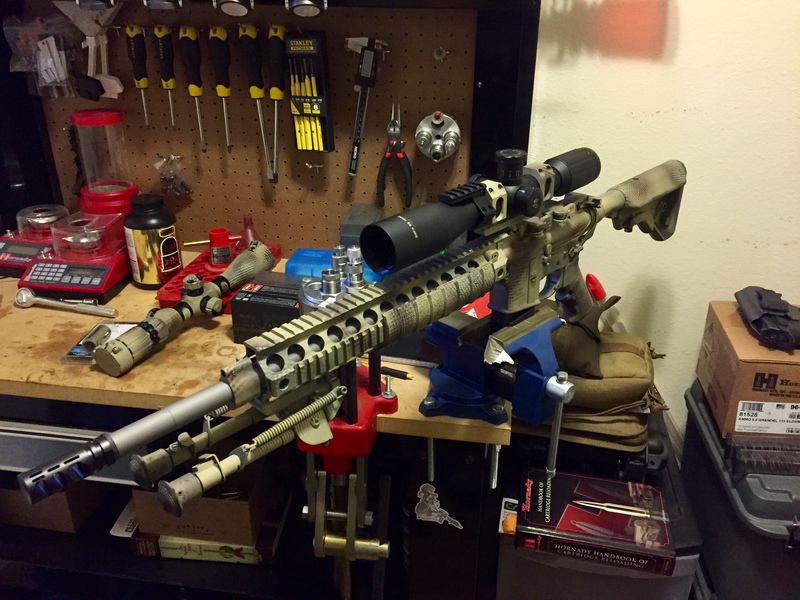 I submit for your criticism, my horizontally challenged "precision rifle" View attachment 6919841View attachment 6919841build. This was the exact rifle I built in my head for a compact suppressed hunting rifle. Well done! I spent my afternoon loading instead of reading the Hide. I’ll take some pics tomorrow morning. @Tony1320 here are the pics. The composition isn’t great because as I wrote, I spent the afternoon reloading. It’s a TL3 with a Proof 6.5. It’ll get another TL3 with a Proof 308 when I get back from vacation later this month, and that action will go back in a chassis. It was 6 1/2 months from order to delivery, but I think it was a little above average due to the folder. My lightweight simple hunting rig. Remmy action, 308 Bartlein med palma 1/13 cut to 20", PSE carbon hunter stock, 6.5-20x50 zeiss, Roedale ultra light suppressor. Weighs 9lbs with scope and suppressor. I used to have the rifle in a tactical stock but have two other tactical type rifles so looking forward to the coming hunting season with a faster handling lighter rifle that is also capable of a 400yd deer. @Tony1320 here are the pics. The composition isn’t great because as I wrote, I spent the afternoon reloading. It’s a TL3 with a Proof 6.5. It’ll get amother TL3 with a Roof 308 when I get back from vacation later this month, and that action will go back in a chassis. It was 6 1/2 months from order to delivery, but I think it was a little above average due to the folder. You post that then don't post what it weighs? Sweet, but how many months of load development do you have? Too many! But, it is all done now and I am really enjoying reloading! 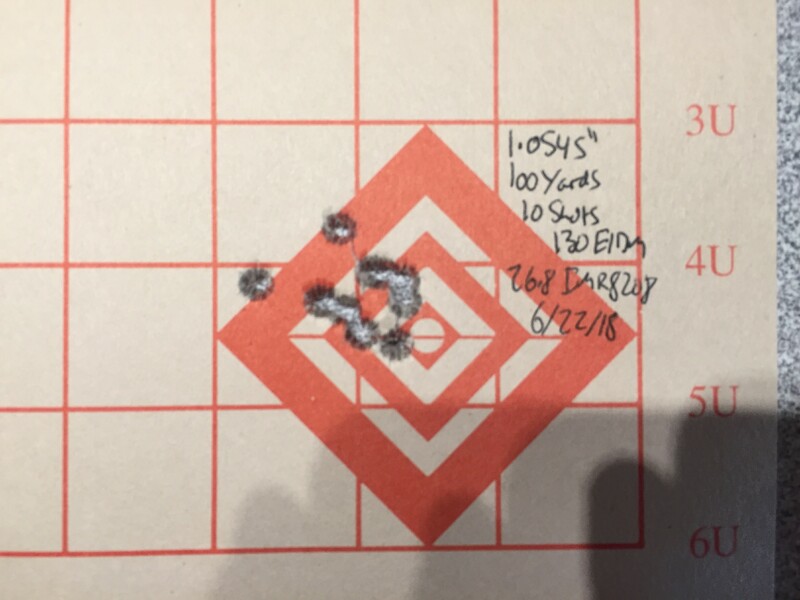 Hi, new here, picked up a Remington 700 from their Custom Shop in 6.5 Creedmoor a couple weeks ago and I am very impressed with the rifle and the cartridge so far, the group shown is a seven shot group at 100 yards but 3 days apart , 3 shot on a Friday when I first shot it and 4 more rounds on the following Monday, was just checking to see if cold clean bore had a different impact and it did not. That’s really nice! What stock is that? Thank you, its a McMillan but I'm not sure which model. Here's my 18" 6.5 grendel build! Absolutely love this rifle. Shoots 1" 10 shot groups, can't ask for more out of this platform. Nice... 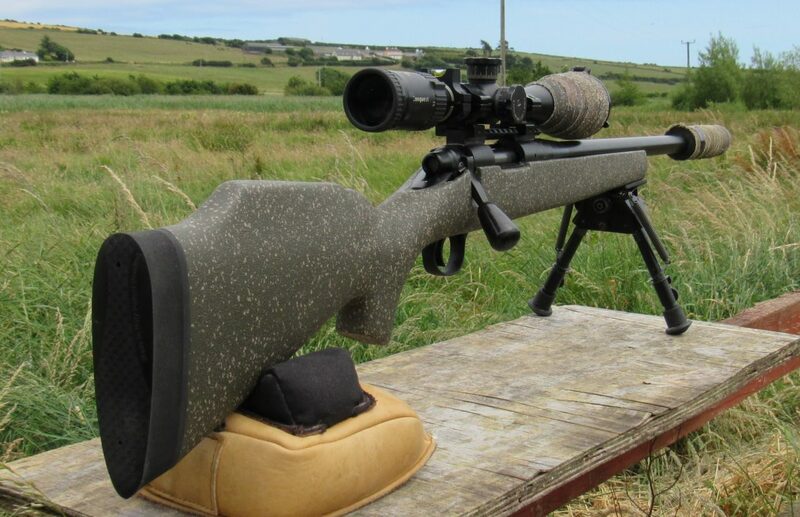 Instead of going full custom on my introduction into Hunter/Precision build I decided to go this route Tikka Tac A1, then in the future after getting a few intro classes in long range/precision shooting I may upgrade or just re-barrel and go the chassis route. Here is my buddy Steve and I at Hawks Double Mountain Ranch, Rotan TX. We attended a Precision Rifle Class - Ultra Long Range last week. Course is taught by Paul McCoy of PMAC Precision and Val from Valdada Optics. These are both PMAC Precision built 7-300WM shooting the 195gr Berger. Both Bartlein barrels. I have the new Valdada Recon G2 and Steve is also running a IOR Valdada. We both hit the 2280yd target. What an incredible experience.